In the USA Market, we have partnered with 134 Grocery Chains in 108 Cities with 13,400 locations to Introduce PocketPlus USA with National Retail, Restaurant and Service Chains to be launched in 5 Months. We expand the number of options PocketPlus 5X to promote your product service or brand, then apply a 5-in-1 Media Advantage. We broadcast your Promotion across Print - Internet - Mobile - Beacons and create MoniPlus. We use convergence to increase the Value of every Transaction while providing enhanced features and benefits and giving you more. - We are profitable the 1st Month w/$5-10 Million in Revenue, 51% Profit margin and scheduled to grow 25-50% monthly. The USA is Global Model. Sure, current money is expensive, cumbersome unsecured and stupid. But ask any small company about the high cost of advertising and promotions. That’s a bigger problem. In the past decade, we have seen the emergence of the digital stream to include voice, data, video and now with the block chain - transactions. Why not use and integrate them all to provide a true end to end solution with new capabilities intertwined with true value-added benefits and intelligence. SmartMoni tackles this head on. Through convergence we deliver whole new solutions. We blend Promotions, Social Messaging & Commerce then integrate it to specific marketp and tailored for better services. 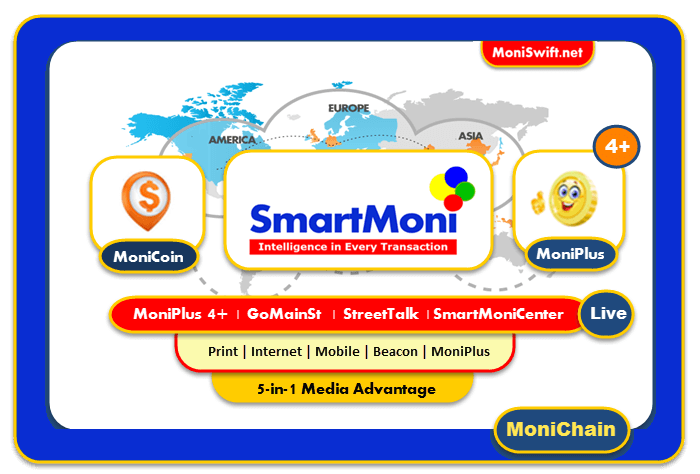 We utilize the data-stream to create SmartMoni. Expanded capabilities and reinvented Commerce by increasing the market engagement of participants at every level while at the same time, extending its reach across 5 different media. SM is planning to raise between $150,000 USD by selling Coins. - A Coin (SmartMoni) will be created on the Waves Platform for crowdfunding.